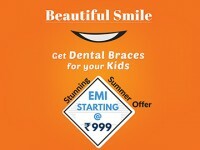 Modern Metal braces are less visible, more comfortable and attractive than the old-fashioned ones. They are more functional and work best in correcting even the most complicated issues of teeth alignment. These conventional braces apply continuous, yet gentle pressure on your teeth over time to gradually shift them to their ideal positions. Yes, Metal braces gets the job done and are considered classic in the world of braces. These braces comprise of standard metal brackets that are bonded to your teeth with a special adhesive and connected by archwires. At each appointment, your orthodontist may tighten the archwires. After the braces have been removed you may need a retainer to hold your teeth in their new positions. If your teeth are crowded or crooked, or if they overlap, Metal braces can straighten things out. If you have malocclusion which means a bad bite, Metal braces can make things right. Pressure of the metal brackets can make your mouth sore, your gums bleed and the inside of your cheeks and lips irritated. The brackets and wires can also trap food particles and increase the likelihood for tooth decay. The metal braces are generally very effective in fixing severely misaligned teeth. However, it is important that you closely follow the instructions of your orthodontist, particularly during the retention period. To ensure stability of the final results and to prevent teeth relapse, retainers may be worn permanently. Metal braces have years of proven success and can effectively realign your teeth to create a straighter and more pleasing appearance. No wonder, the Metal braces are considered the “gold standard” in orthodontic treatment.